A failed metal part or component may bring your manufacturing or construction operation to a standstill. If yours is like many PA companies these days, you might not have the in-house expertise or resources to handle the job. If you need reliable commercial welding services in Central PA, Tuckey Metal Fabricators, Inc., can help. Tungsten Inert Gas Welding (TIG): Tungsten inert gas welding uses a tungsten electrode that is not consumed by the welding process — there is no electricity flowing through the weld during the procedure. TIG welding is a popular choice when the appearance of the weld is essential, as it is less likely to distort the metal. Metal Inert Gas Welding (MIG): Metal inert gas welding offers a cost-effective alternative to TIG welding. The process is also more straightforward to execute — it uses a special shielding gas that protects the weld from impurities and provides a faster, easier cleanup. Stick: Stick welding works well when fusing alloys and joints. The process relies on a consumable stick electrode that simplifies the procedure. 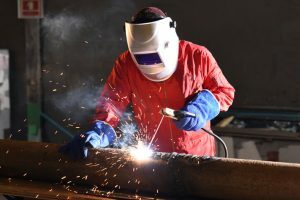 Unlike MIG welding, the weld does not receive protection from a shielding gas. Instead, the electrode receives a flux coating that must be chipped away after completion. AC/DC: We can perform welding with either an AC (alternating current) or DC (direct current) power supply. The former is the least expensive of the two, but it also limits the types of electrodes our welders can use. We typically employ an AC/DC combination welder to get the best of both types. Tuckey Metal Fabricators delivers top-notch contract welding services for companies of all sizes, from small manufacturing shops to larger production plants and more. Examples of the industries we serve include building/construction, HVAC, food service, aerospace, specialty manufacturing and agriculture. 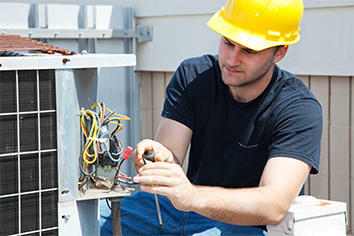 We can also assist you in the Hagerstown, MD area or other regional sites depending on the specifics of your project. 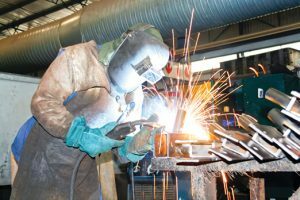 Contact us to learn more about our commercial welding services and get a no-obligation project estimate today.